Bicycle riding is fun, healthy, and a great way to get some fresh air. Before riding, you should always inspect your bike to make sure all parts are secure and working properly. Air- Always check the air pressure in your bicycle tires before you start riding. Pushing down with your hands on each tire lets you not only see, but also feel how much air there is and if any air needs to be added. 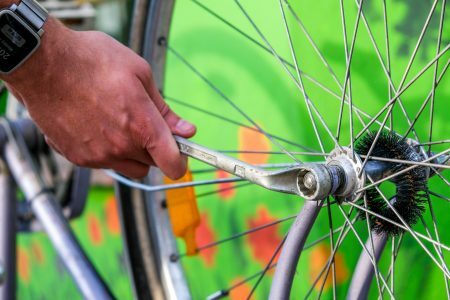 Brakes- Making sure your bicycles brakes work is essential for riding. You can simply check them by pulling the brake handles in and looking to see that your bike does not move when the handles are locked in. Chains- The chains on your bicycle do more than you may think. The chain and cranks need to properly sit on your bike, move smoothly and have no rust. This will ensure that the chain works correctly and that all functions of the bike are possible. The last thing you need to check before riding isn’t on your bicycle; it’s actually on your head! Wearing a properly fitted helmet not only protects your brain but can save your life. A properly fitted helmet should have no gaps between your temples and brow pads; the chinstrap should be snug and it should only allow one finger to be able to fit under the strap. Before each bike ride, be sure to follow the A B C – Bicycle Safety Checklist and ride safe and ride worry free!